The statue of Robert Burns at Burns Common. 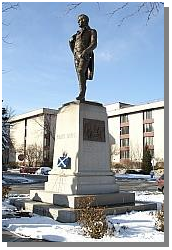 Saint Andrew’s Society of the City of Milwaukee has installed and maintains a growing collection of engraved granite pavers around Milwaukee’s Robert Burns monument. (Commemorative bricks are no longer available for order.) The monument is located on the city’s east side, in the Burns Triangle (the southern portion of Burns Commons), bounded by North Prospect Avenue, North Franklin Place, and East Knapp Street. Proceeds raised through paver orders cover the cost of materials and installation as well as the future repair and maintenance of the Robert Burns monument. We are happy to take your order anytime via this downloadable form. Pavers are engraved and installed periodically, depending on both demand and weather conditions. 8” x 16” $175. Up to seven lines, 20 characters per line. To order, download this form, print it, complete it, and send it in with your payment.